I love reading, and I love the kids in my sons’ kindergarten class. Today I enjoyed both at the same time as part of the Read Across America activities at our school. 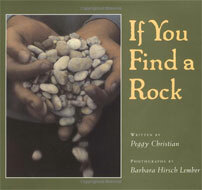 I read one of my favorite picture books of all time, If You Find a Rock by Peggy Christian, and I brought in a handful of treasured rocks to discuss with the kids after reading. The kids were thrilled to talk about rocks, of course. I swear, rock collecting is universal and ageless. Is there anyone on the planet who hasn’t collected rocks at some point in their lives? I also read a picture book story that I wrote. Because it’s only text, I read it from my computer and brought in props, which included a toy dump truck and a toy backhoe. My thirdborn son was worried when I showed up with his toys (“That woman is NOT going to donate my toys to the school, is she? !”) but when I assured him they would return home with me, he settled into the fun. And fun it was. To top the whole thing off, the mom who read before me had chosen a Curious George book that had little George causing chaos in a chocolate factory. A book about chocolate? No wonder I love reading. 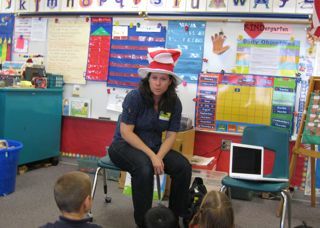 When I saw the photo of you in the Dr. Seuss hat reading to the kinders, I immediately thought, geez, she’s a rock star in that classroom. Then I read the blog entry and realized what a bad pun I had on my hands. Still, I have to say you are adding tons of extra joy to that school experience . . . and to me too, just knowing all that’s going on over there.